While I was browsing through my plethora of food and home magazines, I saw this recipe and it definitely spoke to me. It looked a lot like 煎堆, these pastries that my mom would make for the Chinese New Year holiday, so I knew these would fit right in. When I told my sister about it, she thought it was weird, but I'm willing to try anything once. I'm glad I did, since these were quite tasty. The chocolate and sesame actually work very well together. Since mine were probably larger than the original recipe size and I baked it for about the same time, the middles were still fudgy and soft. After reading the ingredients, the amount of flour was concerning me, however it looked like it worked for most people according to the reviews. I've modified the directions to make it easier to handle. The first ball I tried to roll was still almost pudding like in my hands. I definitely couldn't roll those! I put it in the fridge for another half hour to set. Even then, although it was stiffer, it was still sticky. Then I just dropped the ball in the bowl of sesame seeds and shook it to coat it. It worked much better, my hands didn't get coated with chocolate and I was able to transfer to the sheets easily. In a small saucepan melt chocolate and butter over low heat, stirring frequently until smooth. Remove from heat then stir in tahini. Set aside. In a small bowl combine flour, baking powder, and salt; set aside. In a large mixing bowl beat eggs until frothy. Add brown sugar and vanilla and beat until well combined and light. Beat in chocolate mixture, then beat in flour mixture just until combined. Cover dough then chill at least 1 hour, until easy to handle. Scoop out dough with a cookie scoop, then drop into the bowl of sesame seeds. 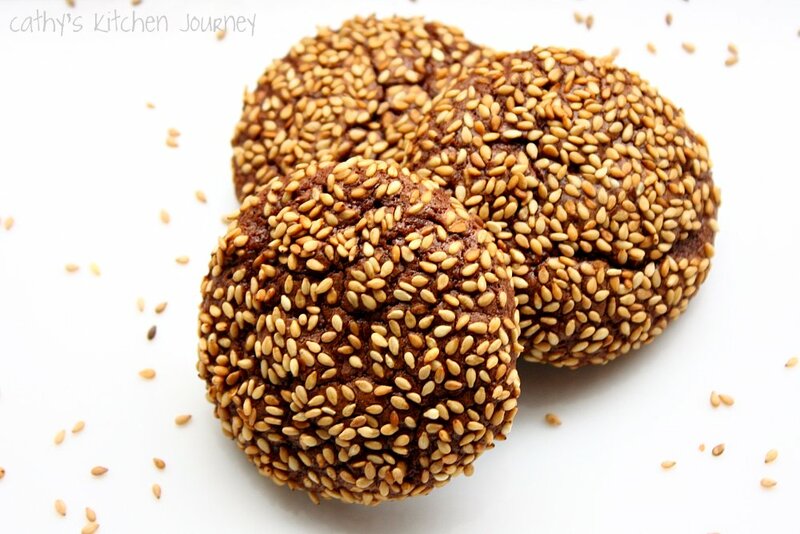 Roll the dough ball in the bowl to cover complete with sesame seeds. Place on cookie sheets 2 inches apart. Bake for 11-13 minutes, until puffed and set on the bottoms. Allow to cool mostly on the sheet, then twist slightly to remove from the sheet, so the bottom doesn't stick to the sheet. Transfer cookies to wire rack to cool completely. Chinese? They sound like a traditional Syrian cookie called barazeh, only a chocolate version! I'm not really sure what it is, but since sesame is prominent in lots of Asian, Middle Eastern and European desserts, I wouldn't be surprised if it reminds everybody of something. I love to hear your comments! Please post below!